Grilled pork chops are a classic, hearty dish which are easy to make. To be honest, they can be made quite easily and successfully by just rubbing them with generous amounts of salt and pepper and throwing them on a hot grill for a few minutes a side until done. But there are a couple tricks that can help kick up that flavor into the stratosphere. For one, some pork meat can be a bit bland relative to more marbled meats like steaks. It can also tend to dry out quicker because the pork meat doesn't have that automatic infusion of melted fat that occurs in a well-marbled steak. So how can you turn up the flavor? Well, obviously one way is simply to cook with a richly flavored sauce, as is usually done with BBQ ribs and the like. However, one of my favorite techniques is to slowly infuse flavor that more subtly compliments and accentuates the natural flavors of the pork, all the while locking in moisture so that it doesn't dry out. I am talking of course of brining. A well crafted brine gets some sweet, salty flavor into the meat and locks in flavor and juices. It isn't just giving a quick fix of flavor on the outside of the meat, it actually infuses the meat itself with goodness! For this perfect grilled pork chops recipe, I use the same brine that I use for other pork recipes, like my Brined Pork Tenderloin. 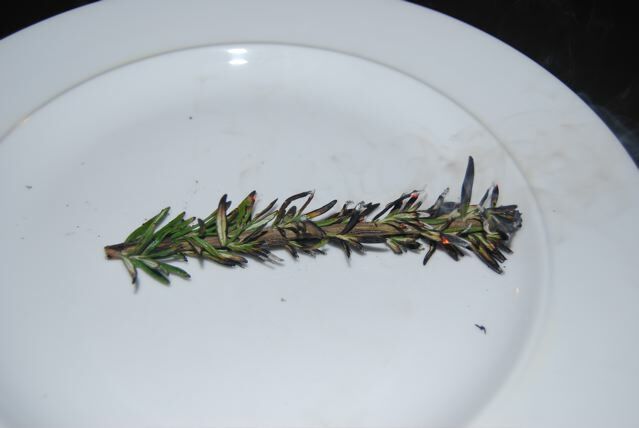 The scorched fresh rosemary sprigs really add a boost of smokey flavor that can't be beat. It may not seem like this simple and quick step would make much of a difference to your grilled pork chops but it does! Don't leave it out! The day before cooking, combine the apple cider, water, sea salt, brown sugar, pepper, sage and cinnamon in a large saucepan and heat up gently, stirring, until all the sugar and salt have dissolved completely. Do not boil. Remove from heat and let cool. 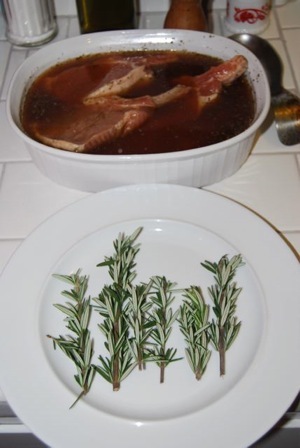 Once the brine is cooled, pour it over the pork chops. This amount of brine should be plenty for 4 large chops. You can double the recipe if you are making more than will fit in this batch. 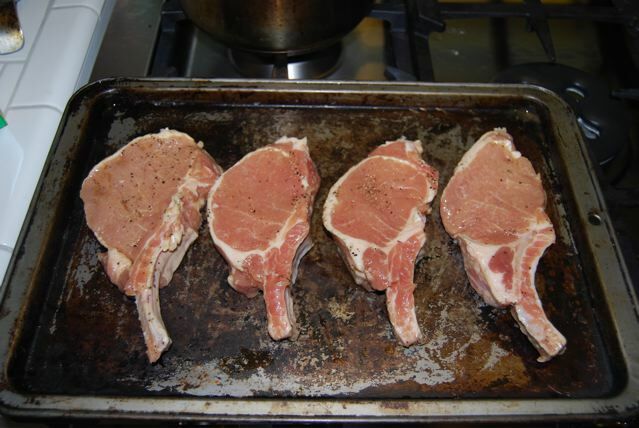 Make sure the chops are completely submerged in brine, cover tightly and refrigerate overnight. About one hour before grilling, remove the pork chops from the refrigerator. Remove the chops from the brine and pat dry with paper towels. Let them sit to come up to room temperature. Prepare a hot grill. You can cook these over high, direct heat but I like to have an area of indirect heat so that I can first sear the chops over the high heat and then let them finish for a few minutes off direct heat. Sear the chops, a few minutes on each side. The move them off direct heat and close the grill to allow them to finish cooking inside. The timing depends on the thickness and size of your chops but they generally only take a few more minutes unless they are very thick. You can generally tell if they are done by gently poking the center with your finger and testing the texture of the meat. If in doubt, use a meat thermometer to test the interior temperature of the pork. 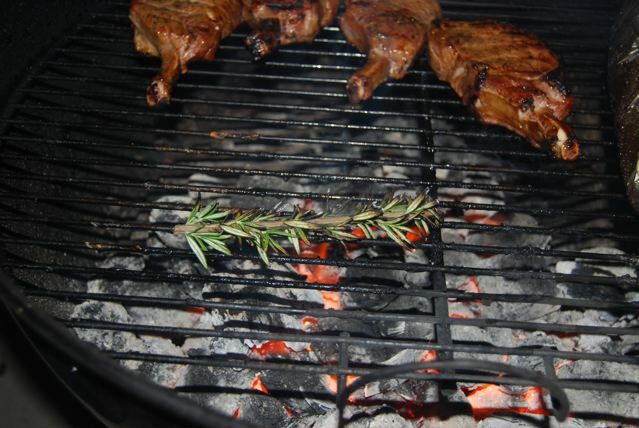 When the chops are almost done, use your grilling tongs to hold the rosemary sprigs as close to the heat source as possible so that it starts burning, smoking and smoldering. When it is smoking abundantly, throw the smoldering sprig on a plate and immediately place a pork chop on top. As it smothers the burning rosemary the essential oil smoke that is released will permeate the underside of the chop and instill an intense and heady aroma and flavor. Repeat this step as necessary for your remaining chops. Serve the pork chops with your choice of sides. Above I've served it with rice and grilled foil-wrapped mixed root vegetables. Enjoy These Perfect Grilled Pork Chops! Done with the Grilled Pork Chops page? Return to the Grill Recipe section.